Graphite is composed of two dimensional sheets of sp2-hybridized, hexagonally arranged carbon atoms — the graphene — that are regularly stacked. 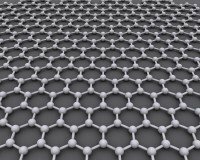 The graphene’s atom-thin sheets, which form graphite by non-bonding interactions, are characterized by an extreme larger surface area. Graphene shows an extraordinary strength and firmness along its basal levels that reaches with approx. 1020 GPa almost the strength value of diamond. Due to these outstanding material’s characteristics, graphene is one of the most promising materials and stands in the focus of nanomaterial research. When sonicating liquids at high intensities, the sound waves that propagate into the liquid media result in alternating high-pressure (compression) and low-pressure (rarefaction) cycles, with rates depending on the frequency. During the low-pressure cycle, high-intensity ultrasonic waves create small vacuum bubbles or voids in the liquid. When the bubbles attain a volume at which they can no longer absorb energy, they collapse violently during a high-pressure cycle. This phenomenon is termed cavitation. During the implosion very high temperatures (approx. 5,000K) and pressures (approx. 2,000atm) are reached locally. 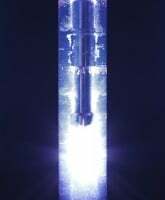 The implosion of the cavitation bubble also results in liquid jets of up to 280m/s velocity. 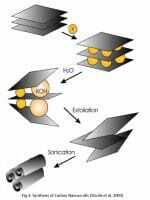 (Suslick 1998) The ultrasonically generated cavitation causes chemical and physical effects, which can be applied to processes. 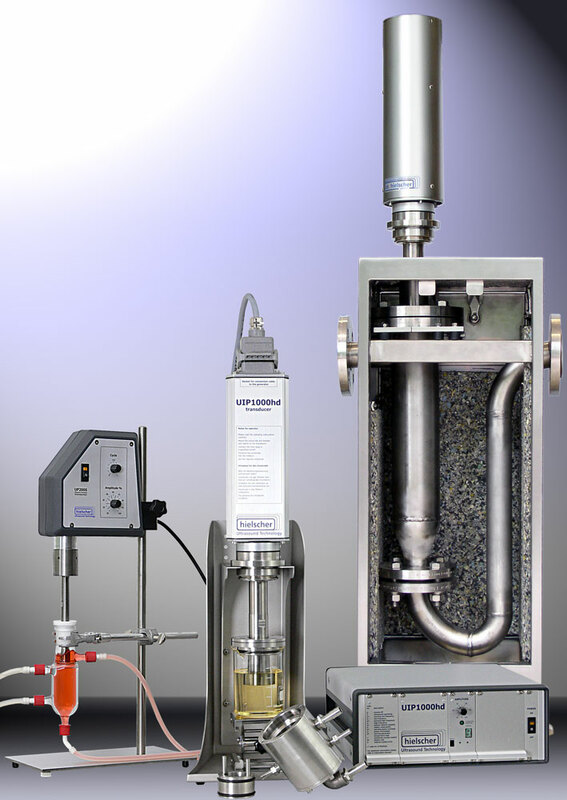 Powerful and reliable ultrasonic equipment for manifold applications, such as homogenization, extraction, nano material processing, or sonochemistry. Ultrasound allows for the preparation of graphenes in organic solvents, surfactants/water solutions, or ionic liquids. This means that the use of strong oxidizing or reducing agents can be avoided. Stankovich et al. 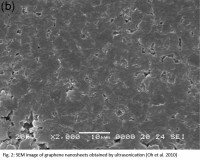 (2007) produced graphene by exfoliation under ultrasonication. Stengl et al. have shown the successful preparation of pure graphene sheets in large quantities during the production of nonstoichiometric TiO2 graphene nanocomposit by thermal hydrolysis of suspension with graphene nanosheets and titania peroxo complex. 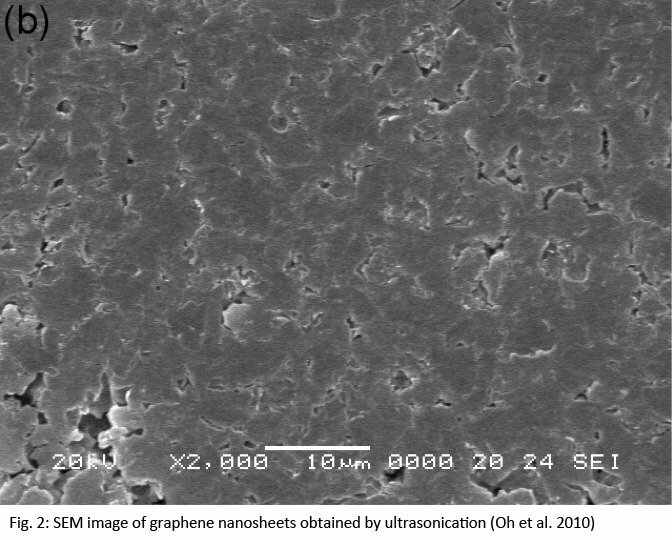 The pure graphene nanosheets were produced from natural graphite using a high intensity cavitation field generated by Hielscher’s ultrasonic processor UIP1000hd in a high-pressure ultrasonic reactor at 5 bar. The graphene sheets obtained, with high specific surface area and unique electronic properties, can be used as a good support for TiO2 to enhance the photocatalytic activity. The research group claims that the quality of the ultrasonically prepared graphene is much higher than graphene obtained by Hummer’s method, where graphite is exfoliated and oxidized. 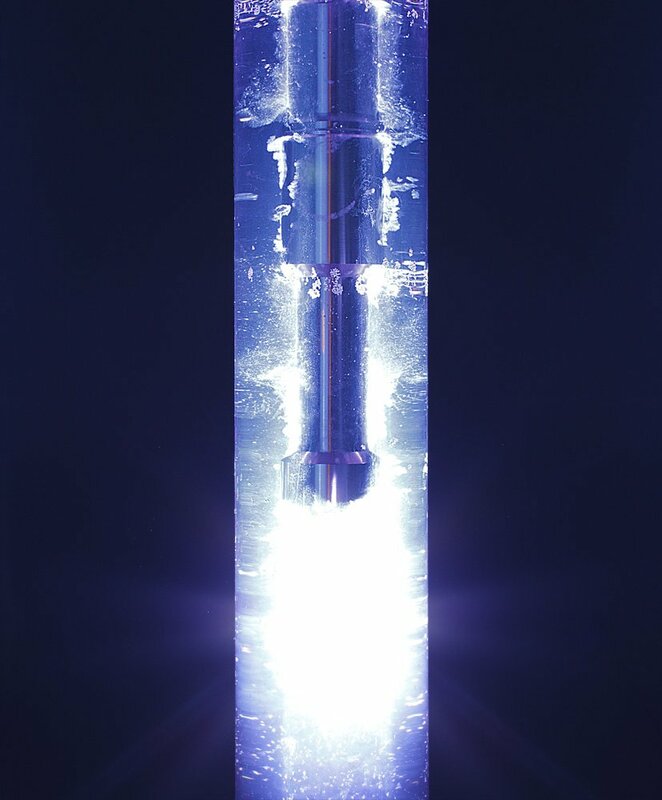 As the physical conditions in the ultrasonic reactor can be precisely controlled and by the assumption that the concentration of graphene as a dopant will vary in the range of 1 – 0.001%, the production of graphene in a continuous system on commercial scale is possible. Oh et al. (2010) have shown a preparation route using ultrasonic irradiation to produce graphene oxide (GO) layers. Therefore, they suspended twenty-five milligrams of graphene oxide powder in 200 ml of de-ionized water. By stirring they obtained an inhomogeneous brown suspension. The resulting suspensions were sonicated (30 min, 1.3 × 105J), and after drying (at 373 K) the ultrasonically treated graphene oxide was produced. A FTIR spectroscopy showed that the ultrasonic treatment did not change the functional groups of graphene oxide. Xu and Suslick (2011) describe a convenient one-step method for the preparation of polystyrene functionalized graphite. In their study, they used graphite flakes and styrene as basic raw material. By sonicating the graphite flakes in styrene (a reactive monomer), the ultrasound irradiation resulted in the mechanochemical exfoliation of graphite flakes into single-layer and few-layer graphene sheets. Simultaneously, the functionalization of the graphene sheets with the polystyrene chains has been achieved. The same process of functionalization can be carried out with other vinyl monomers for composites based on graphene. The research group of Hongjie Dai and his colleagues from Stanford University found a technique to prepare nanoribbons. Graphene ribbons are thin strips of graphene that may have even more useful characteristics than graphene sheets. At widths of about 10 nm or smaller, the graphene ribbons behavior is similar to a semiconductor as electrons are forced to move lengthwise. Thereby, it could be interesting to use nanoribbons with semiconductor-like functions in electronics (e.g. for smaller, faster computer chips). Carbon Nanoscrolls are similar to multi-walled carbon nanotubes. The difference to MWCNTs is the open tips and the full accessibility of the inner surfaces to other molecules. They can be synthesized wet-chemically by intercalating graphite with potassium, exfoliating in water and sonicating the colloidal suspension. (cf. Viculis et al. 2003) The ultrasonication assists the scrolling up of the graphene monolayers into carbon nanoscrolls (see fig. 3). A high conversion efficiency of 80% has been achieved, that makes the production of nanoscrolls interesting for commercial applications. The dispersion grade of graphene and graphene oxide is extremely important to use the full potential of graphene with its specific characteristics. If graphene is not dispersed under controlled conditions, the polydispersity of graphene dispersion can lead to unpredictable or nonideal behavior once it is incorporated into devices since the properties of graphene vary as a function of its structural parameters. Sonication is a proven treatment to weaken the interlayer forces and allows for an accurate control of the important processing parameters. Zhang et al. (2010) have shown that by the usage of ultrasonication a stable graphene dispersion with a high concentration of 1 mg·mL−1 and relatively pure graphene sheets are achieved, and the as-prepared graphene sheets exhibit a high electric conductivity of 712 S·m−1. The results of Fourier transformed infrared spectra and Raman spectra examination indicated that the ultrasonic preparation method has less damage to the chemical and crystal structures of graphene. Biological applications: An example for ultrasonic graphene preparation and its biological use is given in the study “Synthesis of Graphene-Gold Nanocomposites via Sonochemical Reduction” by Park et al. (2011), where a nanocomposite from reduced graphene oxide -gold(Au) nanoparticles was synthesized by simultaneously reducing the gold ions and depositing gold nanoparticles on the surface of the reduced graphene oxide simultaneously. To facilitate the reduction of gold ions and the generation of oxygen functionalities for anchoring the gold nanoparticles on the reduced graphene oxide, ultrasound irradiation was applied to the mixture of reactants. The production of gold-binding-peptide-modified biomolecules shows the potential of ultrasonic irradiation of graphene and graphene composites. Hence, ultrasound seems to be a suitable tool to prepare other biomolecules. 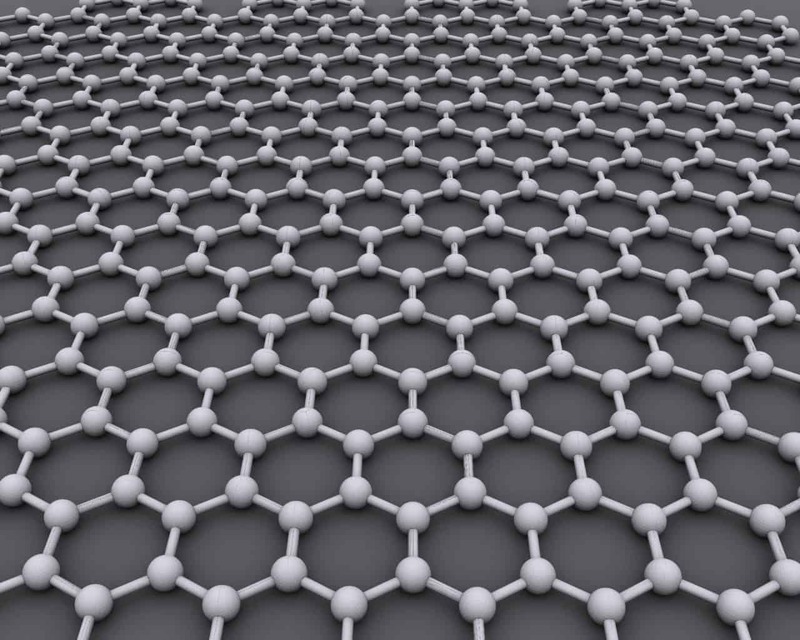 Electronics: Graphene is a highly functional material for the electronic sector. By the high mobility of the charge carriers within the graphene’s grid, graphene is of highest interest for the development of fast electronic components in the high-frequency-technology. Alcohol: For alcohol production: A side application may be the usage of graphene in the alcohol production, there graphene membranes can be used to distill alcohol and to make thereby alcoholic beverages stronger. As the strongest, most electrically conductive and one of the lightest and most flexible materials, graphene is a promising material for solar cells, catalysis, transparent and emissive displays, micromechanical resonators, transistors, as cathode in lithium-air batteries, for ultrasensitive chemical detectors, conductive coatings as well as the use as additive in compounds.